The Regenepure Intense Volumizing Biotin Conditioner is formulated to bring limp and brittle hair back to life with ingredients like Biotin, Tea Tree and Jojoba Oil, Keratin, Silk Protein, Copper Peptides and Saw Palmetto Extract. *Individual results may vary. This product is not intended to diagnose, treat, cure, or prevent any disease. Our Regenepure Intense Volumizing Biotin Conditioner unclogs the hair follicles while replenishing them with useful nutrients that are vital for hair growth. 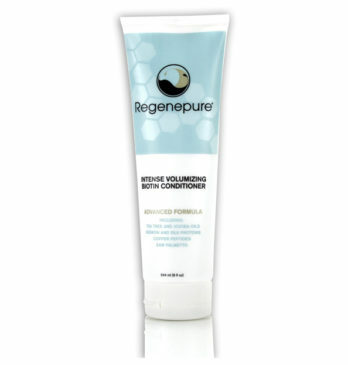 Similarly to our other Regenepure hair care products, our Regenepure Intense Volumizing Biotin Conditioner is free of parabens, sulfates and fragrances, making it perfect for everyday use, especially for those with color treated and Keratin treated hair. With a balanced infusion of vitamins and beneficial ingredients, Regenepure Intense Volumizing Biotin Conditioner is an excellent complement to the Regenepure DR and NT shampoos. Together, they all work to strengthen damaged hair against future breakage.